Get your Free* Book now! How did we transform our health? 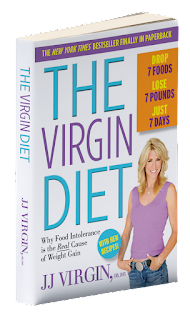 The facts are that our family has been following the knowledge and information of JJ Virgin​ since early 2012 before her book came out. To this day, we live healthier with the KNOWLEDGE of what to eat, when to eat, and how much to eat. We never claim to do it perfect but admit we're shocked at the results over time of discipline and mindful eating. Focus on what YOU CAN EAT! Have a Happy and Healthy 2016! If you desire support or have questions, message me. We all deserve HEALTH through knowledge. Empower yourself with proper information that works (we like to say we're proof). Try this link, to get your book now! Hurry!